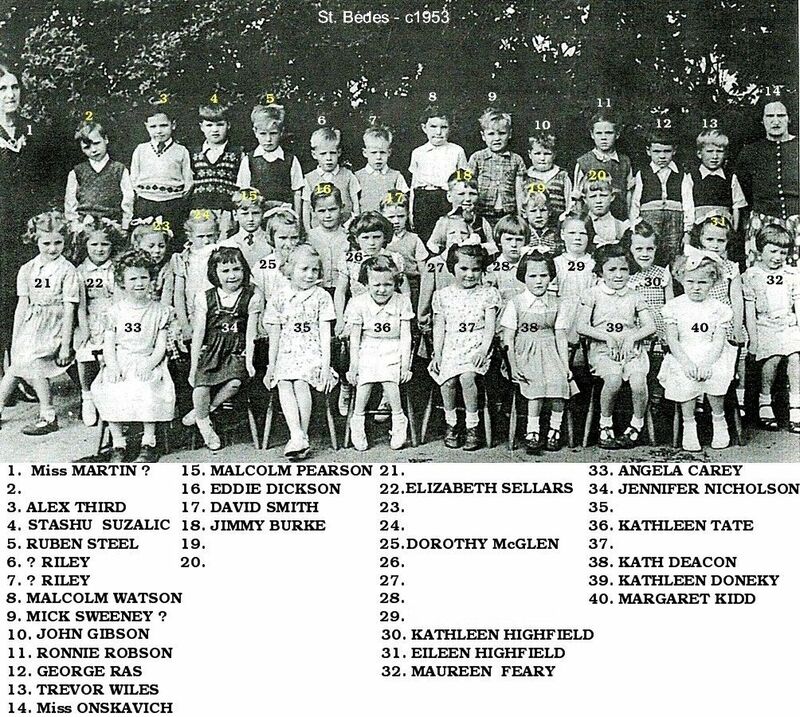 Lesley Thoburn off Bedlington remembered, Facebook, says No 36 is Eileen O'Neil. Anne Donaghy (Facebook) - thinks Nos 6 & 7 are the Riley twins. I thought no.17 looked a bit like me (Joe McNally) but obviously not. Jimmy Burke (No.18) is my cousin but I don't think we were in the same class. 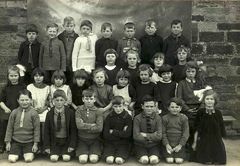 I would have been 8 years old at the time and Miss Onscavich was my first teacher in 1950. 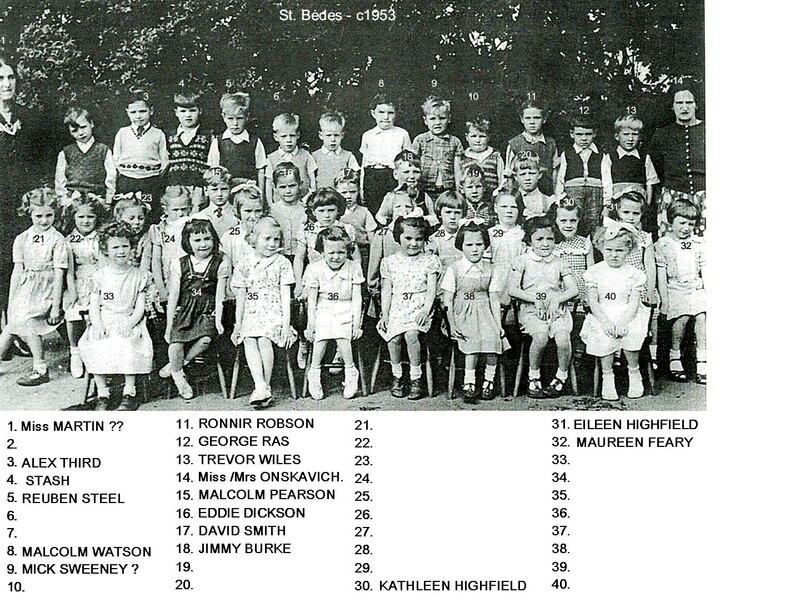 @Joe McNally- I didn't attend St. Bedes but Alex Third - No 3 in the photo - was my mate and the same age as me - I was born Oct 1948. I know when we were teenagers I met the lad 'Stash' = No 4, a couple of times. A big lad for his age and I think his christian name was Stan and I think he had a polish surname. No 33 is Angela Carey and she remembers David Smith and Trevor Wiles. 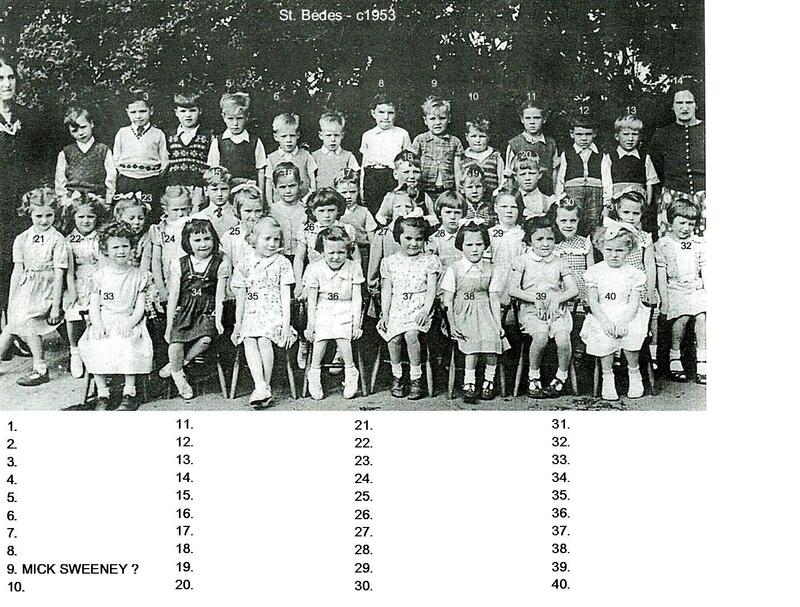 She remembers Patricia Doyle, her parents had the shop at the bottom of Stead Lane. Our grandparents, John and Hannah Carey lived at 35 Stead Lane with our Auntie Mary. Think the shop was called Doyles. Also remember the ice cream horse and cart coming along Stead lane, and you took a dish out to put the ice cream in. 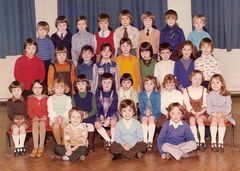 Thanks @Vic Baldry - we still can't identify which one n the photo is Patricia Doyle. Your right about Doyle's shop and I will try and find where it has been discussed on this site (as I am sure it has) and link you in. Names updated by Kath Forshaw - nee Deacon = No 38 from the Facebook group Bygone Bedlington. Norma Agnew, Facebook Bygone Bedlington group, has named No 10 as John Gibson No 29 not Mary Craze says Mary .... ,nee Craze.